Unlimited hop-on hop-off for 24 hours on 60 stops and 4 different routes! Adventure through London on our open top bus tour taking you to the city’s most iconic landmarks and locations. Whether you want to come up close to the Crown Jewels at the Tower of London, see the Coronation Chair at Westminster Abbey, venture through the golden gates of Buckingham Palace, climb the domed galleries at St Paul’s Cathedral, ride on the iconic London Eye, ascend 800 feet on the Shard or stay onboard, there’s something for everyone to enjoy. With over 60 stops to hop-on and off at your own leisure, you’ll be dropped to the doorstep of London’s best-loved locations ready for you to go exploring! 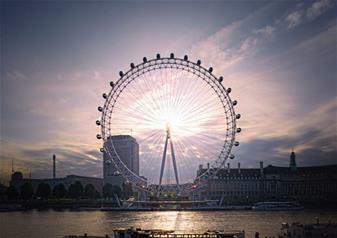 The Coca-Cola London Eye offers breathtaking views of London from high above the River Thames. See Big Ben towering above the Houses of Parliament, follow St. James Park as it sweeps down to Buckingham Palace. A Standard Ticket Experience on the London Eye lasts for approximately 30 minutes, the time it takes for the London Eye to revolve completely. Relax in one of the 32 high-tech glass capsules and enjoy the London skyline at your leisure. Includes groundbreaking film London Eye 4D.